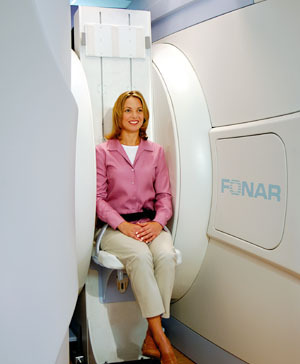 MELVILLE, NEW YORK, October 5, 2011 - In a newly published paper, medical researchers at FONAR Corporation (NASDAQ-FONR) report a diagnostic breakthrough in multiple sclerosis (MS), based on observations made possible by the company’s unique FONAR UPRIGHT® Multi-Position™ MRI. 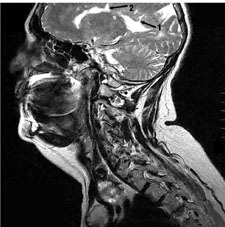 The findings reveal that the cause of multiple sclerosis may be biomechanical and related to earlier trauma to the neck, which can result in obstruction of the flow of cerebrospinal fluid (CSF), which is produced and stored in the central anatomic structures of the brain known as the ventricles. Since the ventricles produce a large volume of CSF each day (500 cc), the obstruction can result in a build up of pressure within the ventricles, resulting in leakage of the CSF into the surrounding brain tissue. This leakage could be responsible for generating the brain lesions of multiple sclerosis. The paper, titled “The Possible Role of Cranio-Cervical Trauma and Abnormal CSF Hydrodynamics in the Genesis of Multiple Sclerosis," has just been published and appears in the latest issue of the journal Physiological Chemistry and Physics and Medical NMR (Sept. 20, 2011, 41: 1-17). It is co-authored by MRI researchers Raymond V. Damadian and David Chu. Commenting on the study, the lead researcher and president of FONAR, Raymond V. Damadian stated, “These new observations have uncovered biomechanical barriers that appear to give rise to multiple sclerosis, and, even more excitingly, these barriers may be therapeutically addressable." Damadian is the medical doctor who discovered the abnormal signals from tissue that are the basis of every MRI image made today and who went on to invent the MRI and build the world’s first MRI by hand at New York’s Downstate Medical Center. The findings are based on viewing the real-time flow of cerebrospinal fluid in a series of eight randomly chosen patients with multiple sclerosis. The cerebrospinal fluid, known as CSF, lubricates the brain and spinal cord. Utilizing FONAR's patented Advanced UPRIGHT® Multi-Position™ MRI technology, the team was able to view the flow of cerebrospinal fluid in and out of the brain with the patients lying down and upright. These invaluable dual observations have only been possible since the invention by Fonar of an MRI capable of imaging the patient upright. Damadian and co-researcher, Chu, discovered obstructions of the CSF flow in all eight patients in the study and, in seven out of eight patients, the obstruction was more pronounced when the patient was in the upright position. The UPRIGHT® MRI also revealed that these obstructions were the result of structural deformities of the cervical spine, induced by trauma earlier in life. 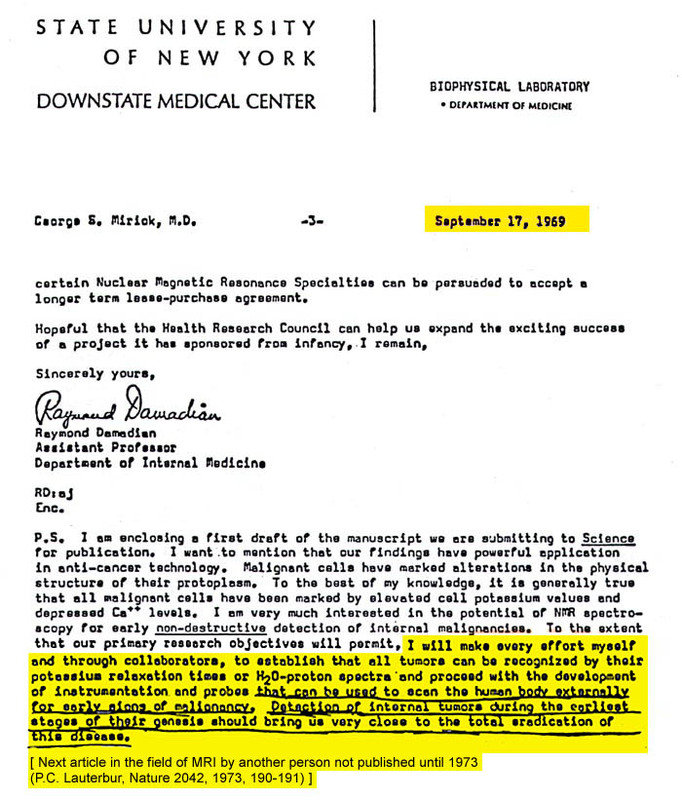 The research was initiated when Damadian and Chu scanned a patient with multiple sclerosis. 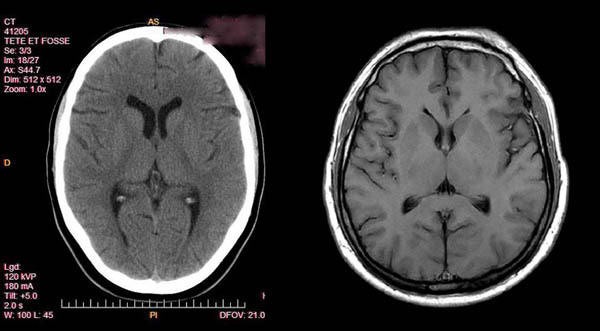 In reviewing the MRI scans, Damadian noted that one of the MS lesions in the patient’s brain was directly connected with the CSF within the ventricles of the brain, which are the structures in which the body continuously produces CSF fluid. It does so through a network of blood vessels within the ventricles known as the choroid plexus. This network generates a large volume of CSF daily, approximately 500 cc. Damadian knew that in multiple sclerosis the lesions are typically concentrated adjacent to the ventricles and are peri-ventricular in distribution (i.e. surrounding the ventricle). He had also determined that the patient had a history of severe trauma to the cervical spine. When a careful history of subsequent patients in the study was taken, it revealed that all but one had also experienced some form of serious traumatic injury to the cervical spine. 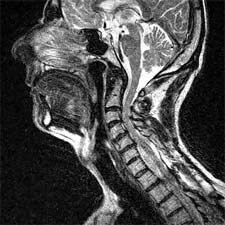 When viewing MRI scans of the first patient, Damadian hypothesized that any obstructions of the continuous circulation of the daily volume of CSF out of the brain to the spinal cord and back could cause increased pressure within the ventricles, which could result in leakage of the fluid into the brain tissue surrounding the ventricles. Damadian knew that CSF fluid contains proteins, which are made up of polypeptides, in fact, that the fluid contains more than 300 polypeptides. Nine of the proteins they form are known to be antigens that stimulate the production of antibodies. He wondered if these proteins, leaking into the brain tissue, could be initiating the antigen-antibody complexes in the brain that cause the pathology and symptoms of multiple sclerosis. The disease results in the destruction of the coverings, or myelin sheaths, that insulate the nerve fibers of the brain. The destruction prevents the nerves from functioning normally and produces the symptoms of multiple sclerosis. The destruction is the origin of the multiple sclerosis lesions seen on the MRI images. But, unlike nerve tissue, the myelin sheaths can regenerate – once the cause of their destruction is eliminated. 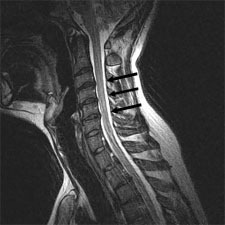 The paper suggests that surgical or biomechanical remediation of the obstruction of the flow of CSF in the cervical spine could relieve the increased CSF pressure within the ventricles and eliminate the resultant leakage of fluid into the surrounding brain tissue and the inflammation of the myelin sheaths that it generates. 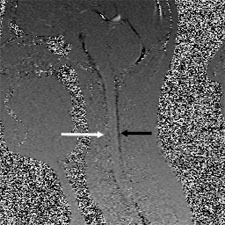 Once the leakage has been stopped, the myelin sheaths could be repaired by the body's myelogenesis process with the prospect of a return to normal nerve function for these nerves. Figure 1 shows the original scan in which Damadian noted that the MS lesion in the first patient arose directly from the ventricles of the brain. The original scan in which Damadian noted that the MS lesion in the first patient arose directly from the ventricles of the brain. 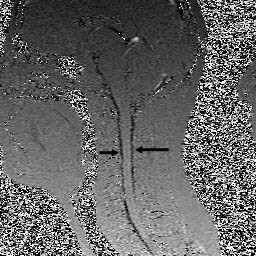 An advanced MRI cine, or movie, of the flow of Cerebrospinal fluid in a normal patient is shown in figure 2a. An axial view of CSF Flow in a normal patient is shown in figure 2b. Axial view of CSF flow in a normal patient. 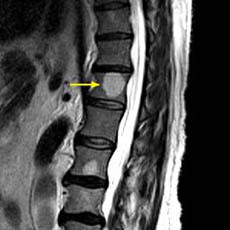 Note the presence of CSF flow (black) fully encircling (360°) the spinal cord in the normal. MS Patient #6. Upright T2 Sagittal. MS Patient #6. Recumbent Sagittal CSF Flow. Ventral and dorsal CSF flow (black) intact in the recumbent position. Upright images of MS Patient #7 (figures 4a and 4b) shows retrolisthesis at C4 and C5 obstructing the ventral CSF canal and herniations of the ligamentum flavum obstructing the dorsal canal. Figure 4c shows the corresponding obstruction of CSF flow in the dorsal canal. MS Patient #7. Upright Sagittal CSF Flow dorsally obstructed. Figure 5c and 5d are axial images of MS patient #5 and shows the obstruction of dorsal CSF flow in both the upright and recumbent positions. MS Patient #5. Recumbent Axial CSF Flow Mid C-3 (white arrow). 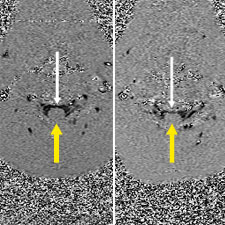 Note the absence of dorsal CSF flow (yellow arrow) in the recumbent image of MS patient #5. MS Patient #5. 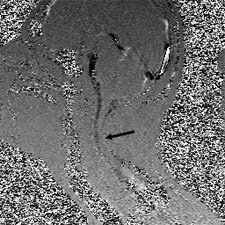 Upright Axial CSF Flow Mid C-3 (white arrow). Note the absence of dorsal CSF flow (yellow arrow) in the upright image of MS patient #5. 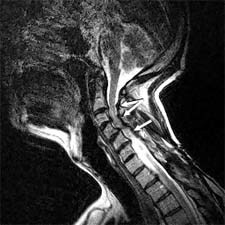 See photo of a patient in the FONAR UPRIGHT® Multi-Position™ MRI. Unlike traditional lie-down MRIs, patients walk into the UPRIGHT™ MRI and sit in the scanner. In the diagnosis of usual spine problems such as back pain, the patients are asked to place themselves in the position that causes their back symptoms. Then an upright MRI image is generated. As a result, the spinal pathology that is causing the patient’s back pain can be more accurately and more completely identified and defined. Since the seat in the MRI can be tilted to any position and also flattened into a bed in the horizontal position, the researchers were able to view the patients in the MS study in both the recumbent and upright positions. The study was part of ongoing research at the UPRIGHT® MRI CENTER at FONAR Corporation, which invented the UPRIGHT® MRI scanner. Research at the center, which is located in Melville, New York, has already provided unique diagnostic views of the upright spine with the weight of the body on it, including the spine with the patient bending forward and backward, radiation-free monitoring of scoliosis, upright imaging of pelvic floor problems in women, such as a prolapsed bladder or uterus, sit-down imaging of the prostate without the usual endorectal coil, and a walk-in, sit-down 10-minute scan that allows for cost-effective MRI scanning of patients undergoing chemotherapy to monitor tumor responses biweekly. 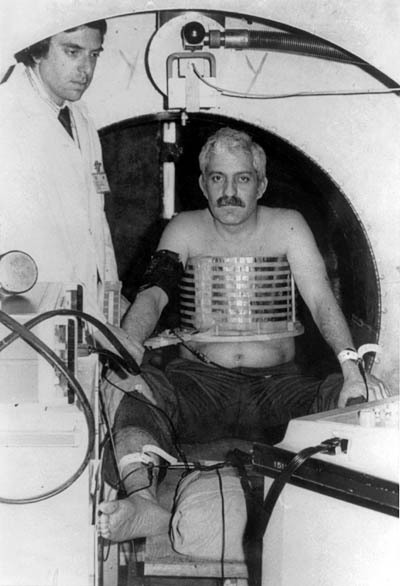 Raymond V. Damadian is the medical doctor who first proposed scanning medical patients by NMR (nuclear magnetic resonance, the original name of the MRI) based on his discovery of the principle on which all modern MRI is based – the different NMR signals that tissues emit in a magnetic field. The amplitude of these signals accounts for the pixel brightness in every MRI image. Figure 7. 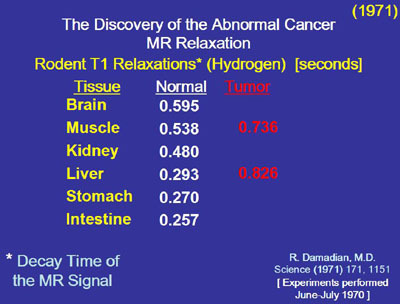 Original 1971 data in Science showing the lengthening of the decay time (relaxation time) of the NMR signal of cancer relative to normal (e.g. liver cancer 826 milliseconds (msecs) vs 293 msecs normal liver, 736 msecs Walker Scacoma vs. 538 msecs normal muscle). The data additionally shows the pronounced differences in the NMR signal decay rates of the normal tissues (e.g. 257 msecs intestine vs. 595 msecs for brain). Figure 8. He discovered that the NMR signal amplitudes of cancer tissue differ markedly from the NMR signal amplitudes of the normal tissues because of the differences in their rate of decay. 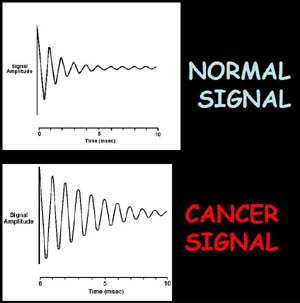 The above is an example of the difference in the decay rate of an NMR signal from cancer tissue relative to the decay rate of a normal tissue. The longer the signal decay the higher the signal amplitude computed from the NMR signal. The amplitude of the tissue NMR signal sets the brightness of the pixel (picture element) in the image assigned to it. 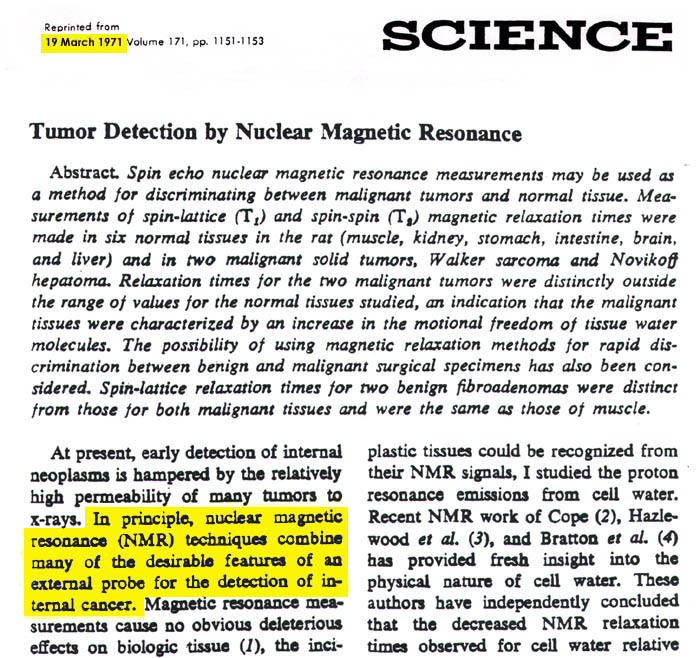 He discovered that the NMR signal amplitudes of cancer tissue differ markedly from the NMR signal amplitudes of the normal tissues because of the differences in their rate of decay. These signal amplitude differences enabled cancer tissues (Figures 9-11)and other tissues to be visualized in MRI images because the signal differences generate the needed brightness differences (contrast) in the picture elements (pixels) needed to visualize detail in the MRI image. He simultaneously discovered that the NMR signal amplitudes also differ markedly among the normal tissues themselves because of the differences in their rates of decay (see Figure 7). This allows the different normal tissues to be distinguished from each other and achieve the exceptional anatomic detail MRI pictures are known for. 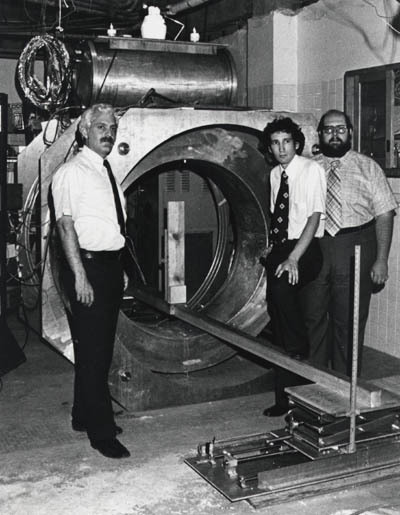 Damadian went on to build the first MRI scanner by hand, assisted by his two post-doctoral students, Michael Goldsmith and Larry Minkoff at New York’s Downstate Medical Center and achieved the first MRI scan of a healthy human body in 1977 and a human body with cancer in 1978. Figure 14. 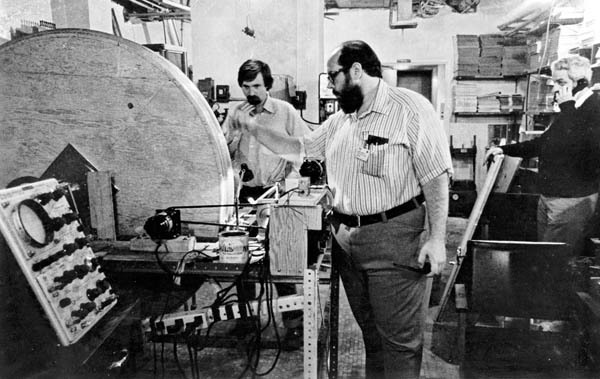 Michael Goldsmith, Raymond Damadian and Michael Stanford beginning the winding of thirty miles of Niobium Titanium wire on one of the two solenoid (circular) winding frames that would compose Indomitable's MRI magnet. Figure 15. 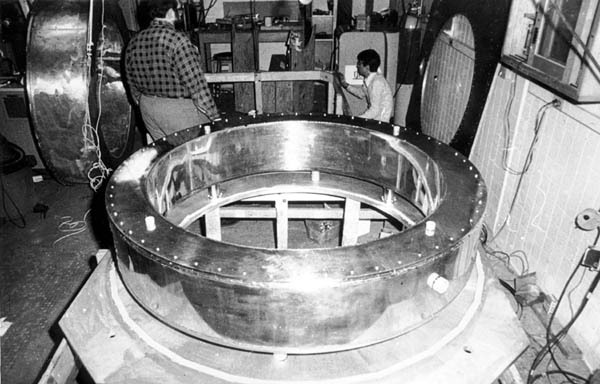 One of the two liquid helium dewars under construction that would house one of Indomitable's two superconducting magnet coils and maintain the necessary -269° C temperature needed to establish superconductivity in the Niobium Titanium magnet coil. Figure 16. 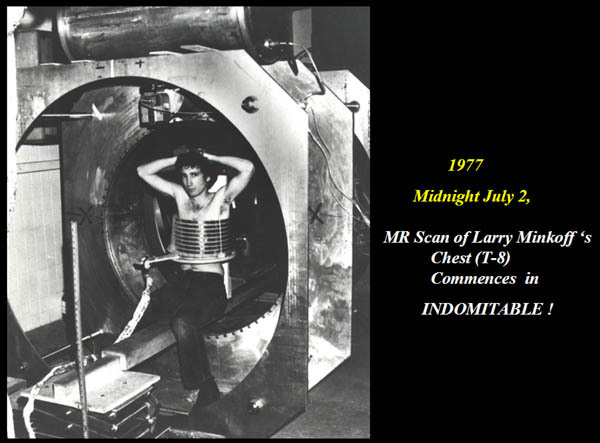 Raymond Damadian, Larry Minkoff and Michael Goldsmith with "Indomitable" and its iced liquid helium and liquid nitrogen ports: the world's first supercooled, superconducting MR scanner and the world's first MRI machine. Figure 17. The unsuccessful first human MRI scan of Damadian. 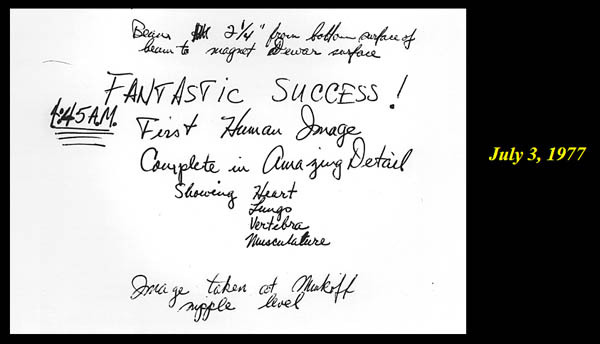 Goldsmith concluded that Damadian was simply "too fat" for his NMR receiver coil (the multi-conductor helix around Damadian's chest). Figure 18. L. Minkoff in Indomitable with some "room to spare" inside the Goldsmith receiver coil. Figure 19. 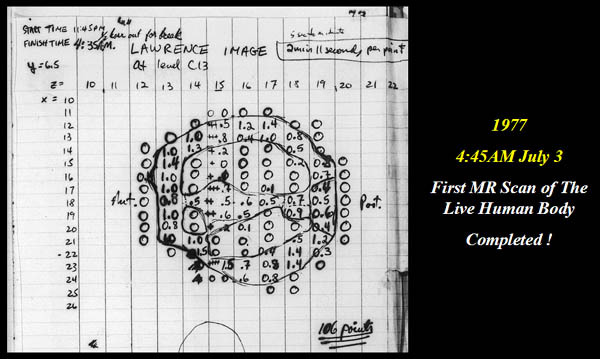 The data of the first live human MRI scan of L. Minkoff's chest consisting of 106 data points acquired over four hours and forty five minutes. Figure 20. 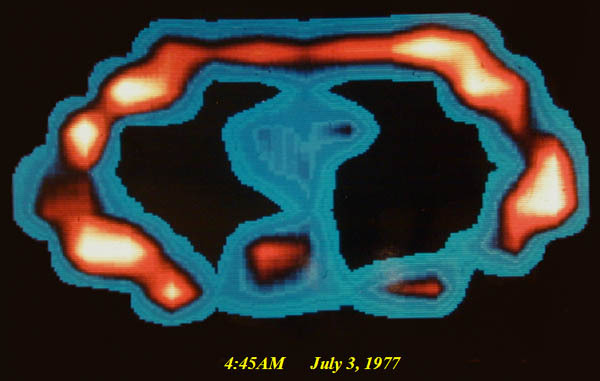 The interpolated image of the Minkoff scan and the first ever MRI scan of a live human being (4:45 AM July 3, 1977). Figure 21. July 3, 1977 the 4:45 AM jubilation of Team Indomitable. For these discoveries he received the National Medal of Technology from President Reagan in 1988, was inducted into the National Inventors Hall of Fame in 1989 as the inventor of the MRI and was named Inventor of the Year in 2007 for his invention of the FONAR UPRIGHT ® Multi-Position™ MRI. He founded FONAR to bring MRI diagnosis to patients. The company manufactured and installed the world’s first commercial MRI in 1980. Damadian is currently FONAR's president and chief research officer. David Chu is the head MRI scientist at FONAR who specializes in the imaging of the cerebrospinal fluid with advanced cines, or movies, which allow for observation of CSF flow in real time. The technology, which the company calls TrueFlow™ Imaging, made the diagnostic breakthrough in multiple sclerosis possible.